The directory aims to promote female voices in the industry after new research reveals a lack of diversity at industry events. RADA tutor Sheelagh McNamara runs through a speech projection exercise at Tuesday night's Women in PR event. Although two-thirds of PR and communications professionals are female, only a quarter (24%) have spoken at industry events, highlighting a ‘gender say gap’ in the industry, new research from market research consultancy Opinium has found. The research, which polled 180 PR professionals, also found that more than half (53%) had experienced events with all-male speaker and panel line-ups, and a similar proportion (49%) indicated there was a lack of diversity. Other findings from the research include a tendency to repeat the same speakers at industry events. Three-quarters of women responding to the study said that speaking at events and conferences had helped raise their profile and 31% said it gave them new opportunities. "It’s staggering that in an industry awash with charismatic, bright and talented women from all backgrounds, many industry events are still fielding all white or all male panels," Women in PR president and Golin managing director Bibi Hilton said. "If conferences want to stay relevant and attract attendees, they need to wake up and ensure they are recruiting diverse speakers – particularly women from BAME backgrounds." 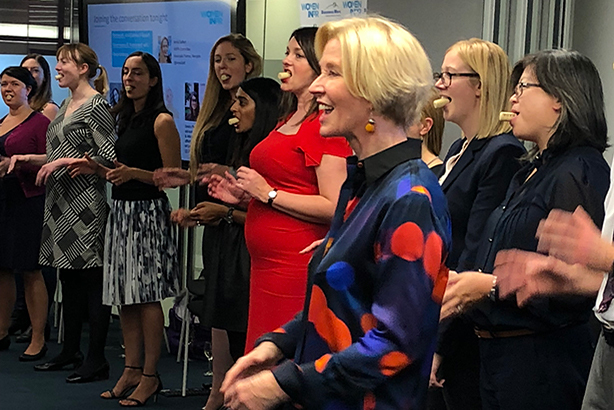 A problem that was highlighted at Tuesday night’s Women in PR directory launch event is that PR and communications professionals can take a stronger role in championing diversity at events on behalf of clients. Man Bites Dog chief executive Claire Mason told PRWeek: "We need to differentiate corporate communications and thought leadership communications. For corporate communications you would want the chief executive of a company to speak, but when you are looking for a technical expert, they often sit at a level or two below board level. There is no reason why those people can’t be empowered to provide their perspective. "Obviously women have not reached gender parity at board level yet, but women dominate the CMO field and are also often heads of communications. I think as communicators we are too often in the background. We know a lot about the strategy of the business, we write the speeches for other people, so as professional communicators we should be willing to go on panels and represent our business and build our own profile." Mason said there is an "enormous opportunity" for communications professionals to provide diverse thinking and "fronting" at events. She said colleagues are well placed to influence clients over who they should put forward as thought leaders. The female speaker directory is a positive initiative to drive change. It is available on the Women in PR website. Female PR professionals who would like to be listed in the directory should visit the Women in PR speakers webpage.